Here is a cocktail just perfect for summer and to help us celebrate Bastille Day, the French national holiday that commemorates the storming of the Bastille, which took place on 14 July 1789 and marked the beginning of the French Revolution. This is a cocktail that celebrates the simplicity of the French lifestyle yet each ingredient has unique essences that adds complex flavors found in their cuisine. In this drink I like to use the Scottish-made Hendricks’s gin. It is first instilled with coriander, juniper, and citrus peel, and then infused with cucumber and the essence of orange and rose. I love all of the Fee Brothers bitters because the essence of orange is just superb. Available at online at Awesome Drinks. 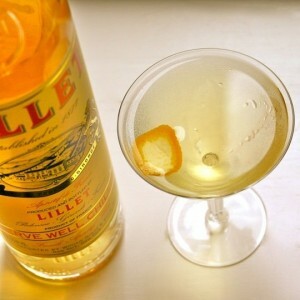 The super star of this cocktail is the very French Lillet Blanc. Produced in Bordeaux since 1872, it is a light, breezy apéritif for white wine lovers. Citrusy and spicy, it has a hint of honeysuckle, a honeyed texture and the golden color of a summer sunset. Find it online at KL Wines. Stir ingredients together with ice and strain into two cocktail glasses. Garnish with a thin slice of orange peel, twisted over the drink to release its essential oils.